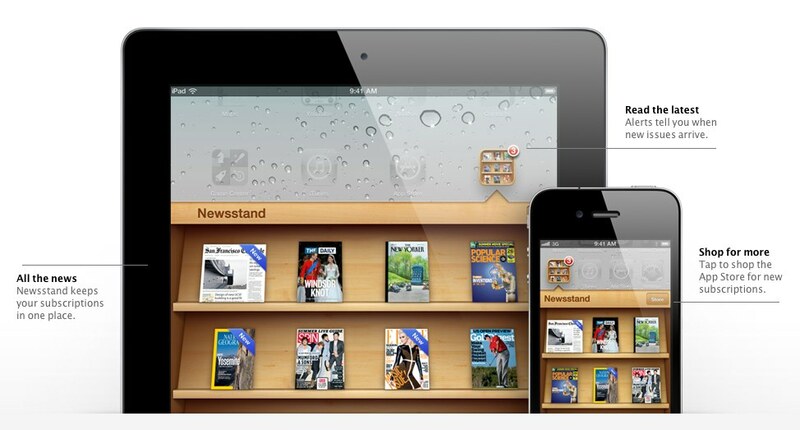 One of the standout features of iOS5 announced by Apple at the WWDC recently was Newsstand. Newsstand will place an electronic newsagent on the desktop of iOS devices, it will allow purchase of subscriptions and download the latest issues of subscribed magazines in the background. It is hoped that Newsstand will become the place to browse for magazines and will remove the problem of magazines being lost within the vast numbers of apps on the app store. As specialist iPhone and iPad developers we have been looking into how we can utilise the functionality of Newstand to help our customers increase their revenuve. We have investigated all aspects of Newsstand from in app purchase of individual magazines and subscriptions to the use of push notifications to inform subscribers of new issues downloaded on their device. We have pulled this information together and have come up with an inexpensive solution to allow new and established publishers to enter the exciting world of digital magazine publication. Our solution provides a dedicated content management system to allow you WYSIWYG editing of your copy and the ability to output that as a digital magazine app for listing on the Newsstand. The app can be as elaborate or simple as your budget allows. If digital magazine publication and seeing your magzine for sale on Apple’s Newstand is something that you or your business and brand wish to be part of then feel free to get in touch to discuss your requirements.